Used book, 385 pages. Rubbing wear and foxing of cover. The Korean War - America's forgotten war - was one of America's most brutal, claiming the lives of American soldiers at more than three times the rate of losses in Vietnam. At the helm was the towering military hero Douglas MacArthur, whose pride and insubordination took the conflict to the edge of nuclear war. 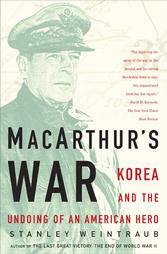 In MacArthur's War, acclaimed historian Stanley Weintraub offers a blow-by-blow account of the months of MacArthur's command. Relying upon extensive new research and giving voice to ordinary soldiers, Weintraub has crafted a horrowing tale of modern warfare at its bloodiest and a telling portrait of the man who was the driving force behind it all.